This felt like a very useful episode. Not only did it somewhat serve as a breather, but we also got a ton of Illya card installs. Leading to a pretty entertaining showdown with Kuro. I do think Illya did need a bit of a kick in the pants and a reminder of how they really don’t have the right to complain about their situation right now. It’s a bad situation, but it isn’t like they are completely helpless here. They have the ability to stand up and just have to do everything in their power to save Miyu and turn this situation around. This is a situation where they did need to stand on their feet and not get shaken. Miyu might not have a lot of time and any second they waste feeling sorry for themselves takes away from that limited time. 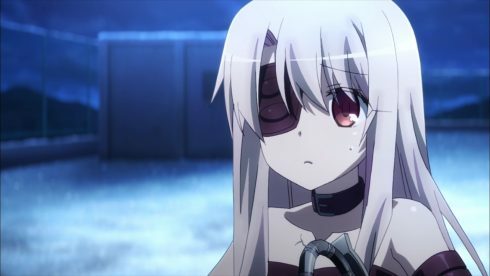 It is no wonder that Illya got shaken up here. She can pick herself up in a crisis, but when you give her some time to take in an overwhelming situation it is easy to get shaken. All the stress and shocking events just kind of fell on top of her like a ton of bricks. Really she had little time to just deal with the mess she’d gotten into. 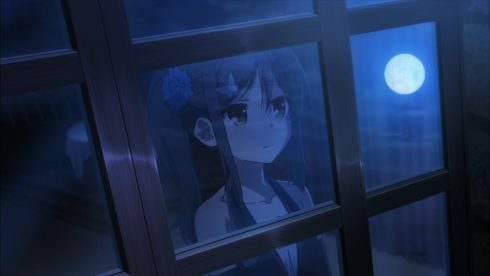 Showing up in a different world by herself, not having anyone she knows around, cold, tired, hungry, attacked by insanely powerful enemies, and coming close to Miyu but not close enough. Honestly running into Kuro again just kind of let her release all that pent up fear. Just added to that sense of dread when it was hammered home by Bazett that she is the only one who can really use these cards and thus their Ace. 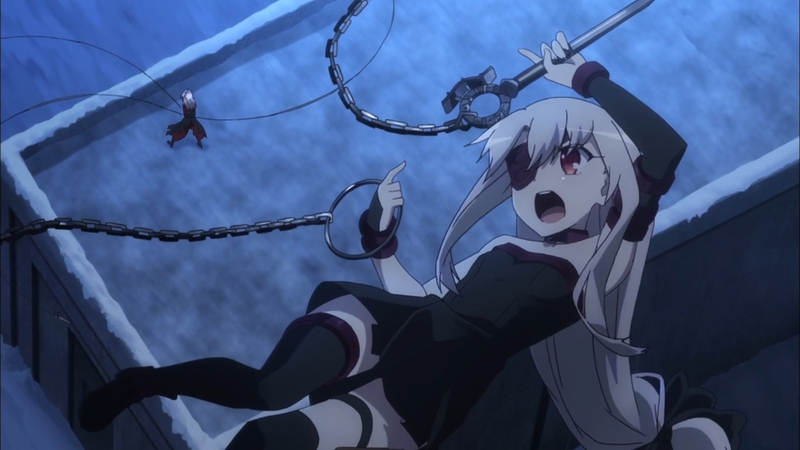 Illya has come a long way, but she is still a kid who will stumble occasionally. 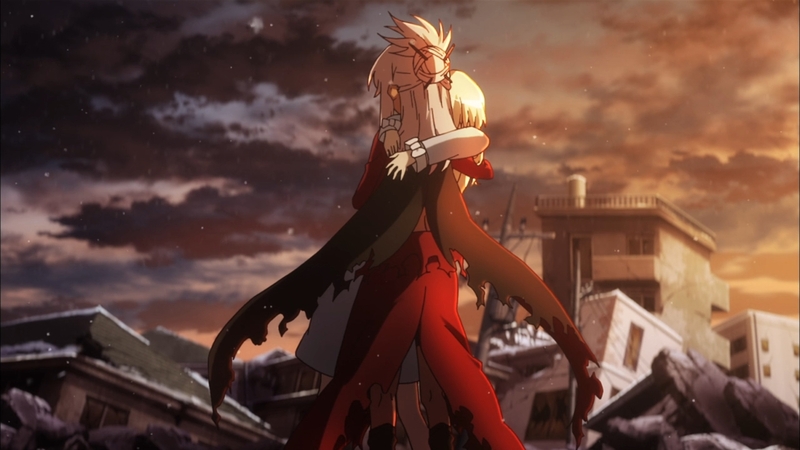 While the method was rough, this was just a case of a sister helping to pick her sibling back up again. Tell her what she needs to hear right now and not necessarily what she wants to hear. 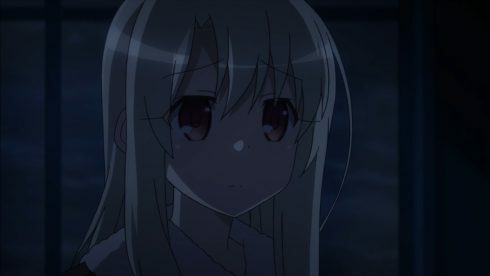 It is hard where Illya is standing. She’s stuck in a world without the comforts she had before. Not literal comforts, but emotional ones. Before they could always go back home and re-charge after a tough fight. But there is no going back right now. In a sense they remain in enemy territory here. They don’t get to retreat to peace and comfort until they put down the Ainsworths. It is a real Holy Grail War in that sense. You can fall back to relative safety, but there is no getting away from the stresses. 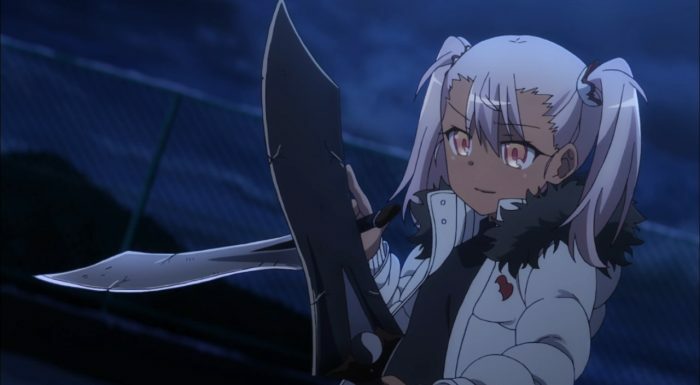 Of course Kuro made some good points. All the things they are feeling right now….is what Miyu has been carrying from the beginning. She came to this world without friends, family, or any comforts. Miyu came knowing that her brother was left behind and probably not knowing his fate. Then she arrives and is dropped into the class card collection which was a series of dangerous and frightening battles. The action never really stopped either until she came back to the last place she ever wanted to be. And while we might have issue with Miyu never opening up, she didn’t ever openly complain about her situation and what happened. Miyu just did what she had to do. And right now they have to do what is necessary. 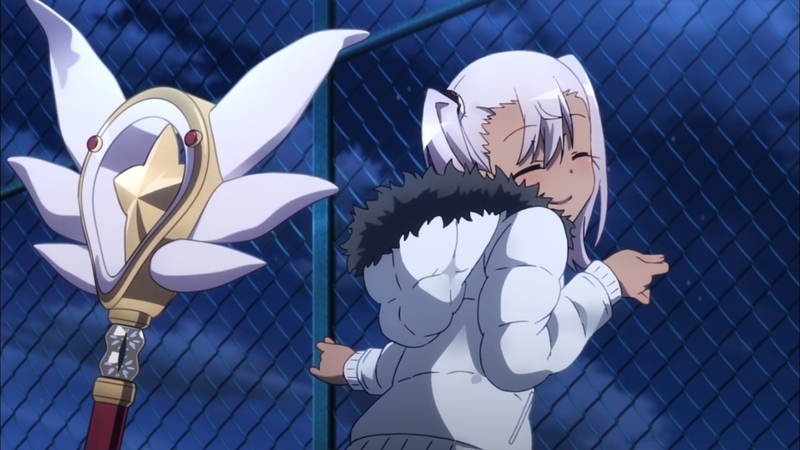 This was also I think a kind of training regimen for Illya. Kuro needed to push her to the point where she could start using these cards. Illya needs to both understand what these cards can do and how it feels to fight while using them. While she can make use of them from the first install as she did with Caster, it is better to know what the cards can do so she can pick the right one. No good to randomly just pick a card and hope for the best. There are good and bad matchups after all. No shortage of fun with the cards here. Got a fair amount of use from each though they were pretty quickly unleashed. 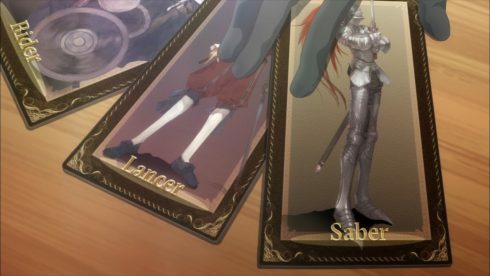 Some pretty familiar servants from previous Fate series. Lancer, Cú Chulainn. While things don’t often work out for that guy, his abilities are top notch. 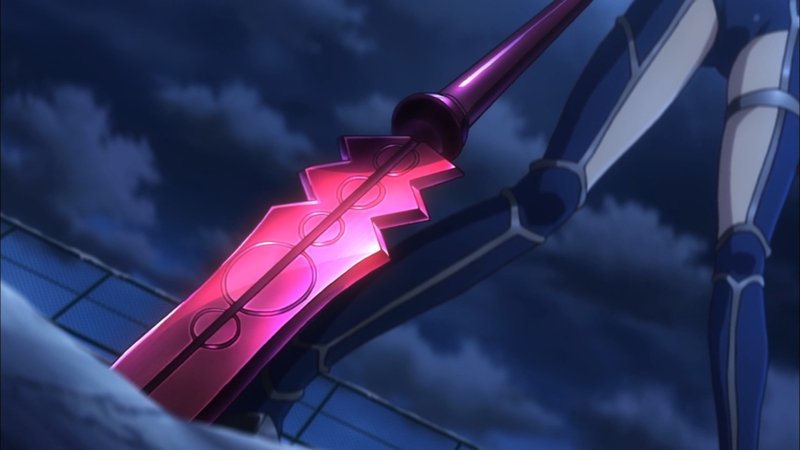 Using an incredibly powerful lance, Gáe Bolg. 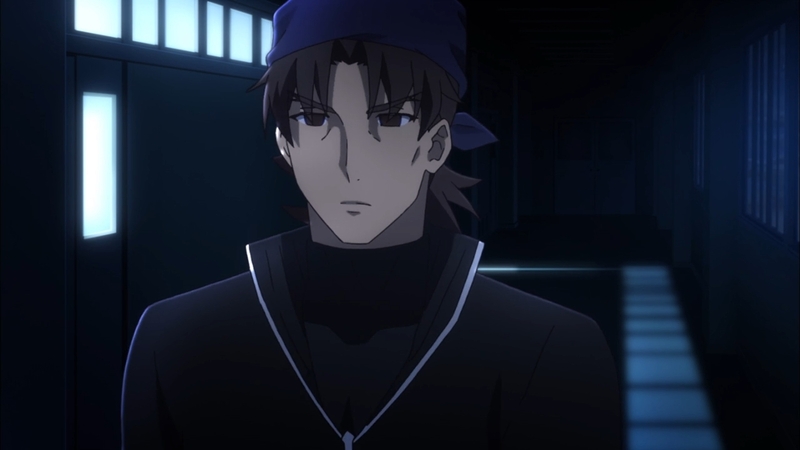 Definitely one of the scarier noble phantasms to be on the other side of with the ability to reverse causality and start from the point that it has pierced the enemy’s heart. The one advantage for Kuro there was that Illya would never activate such a noble phantasm. 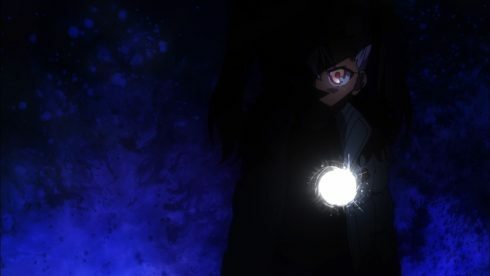 Also an advantage that Kuro revealed that she could remove the seal Rin put on her back in 2wei. Moving right on to Rider after that. 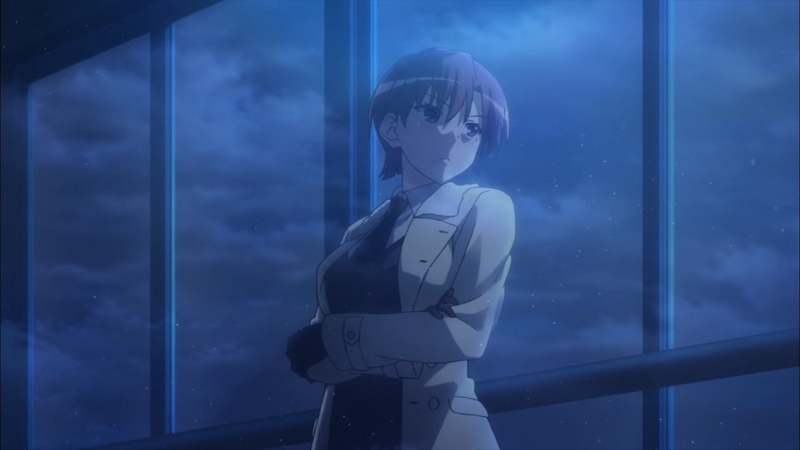 A card we saw Miyu use before in her fight against Bazett. We’ve seen all that this card can accomplish in that fight. The speed shown here, but also the ability to summon and ride a Pegasus. On top of that having magical eyes that can freeze a target into place before attacking. The finishing touch was one of the most well-known servants from the franchise. Saber or King Arthur. 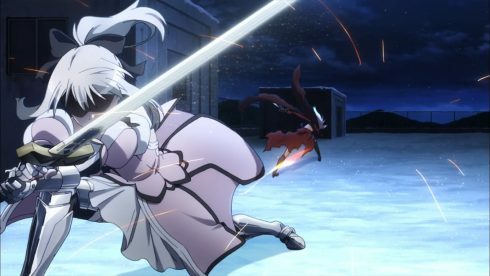 While Miyu had the familiar Saber dress and attire, Illya is instead using the “Saber Lilly” armor, but the effectiveness and power is unchanged. 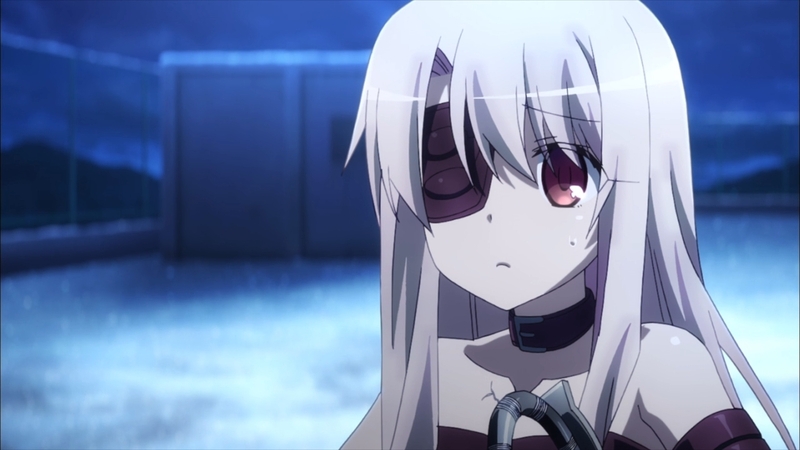 Likely the series simply chose that appearance because it did match Illya’s usual pink attire when using Trance. 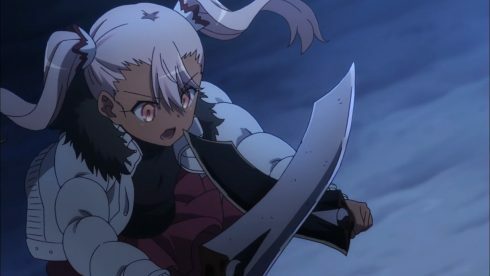 I tend to agree with Kuro that it is almost silly to be afraid when you have Excalibur in your hands. Even if she’s facing an unbelievably powerful weapon like Mjolnir….doesn’t mean she can back down. Use one of the best weapons a human has wielded and go full tilt. 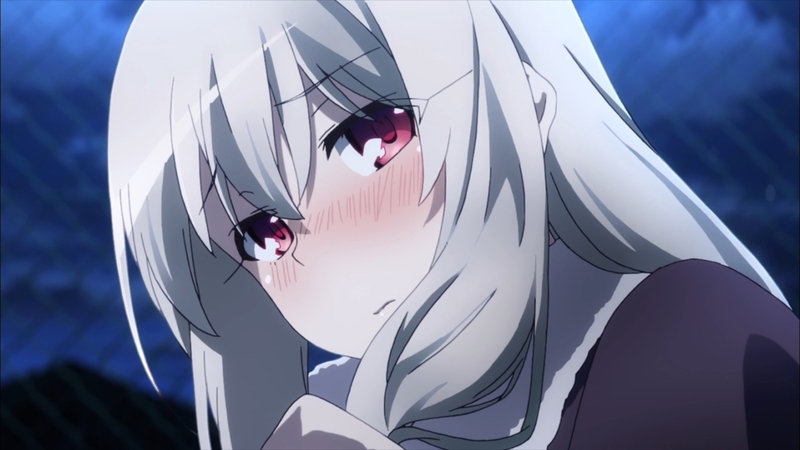 Of course the show had to throw in that bit of fanservice. 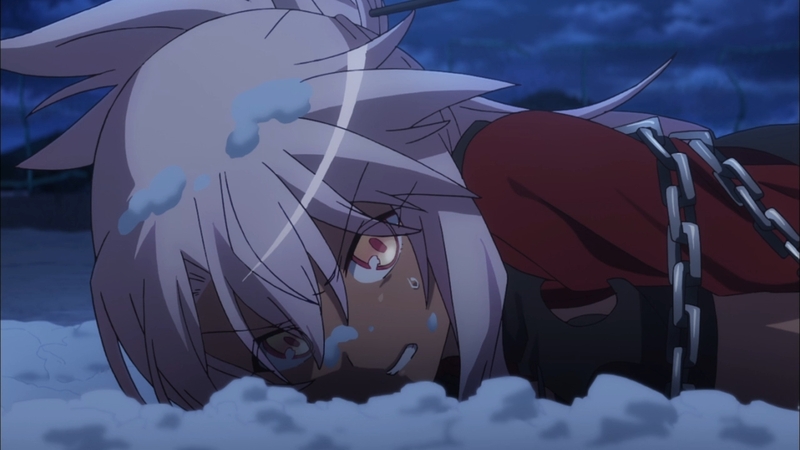 Although in reality…Kuro was likely insanely low on prana at that point. 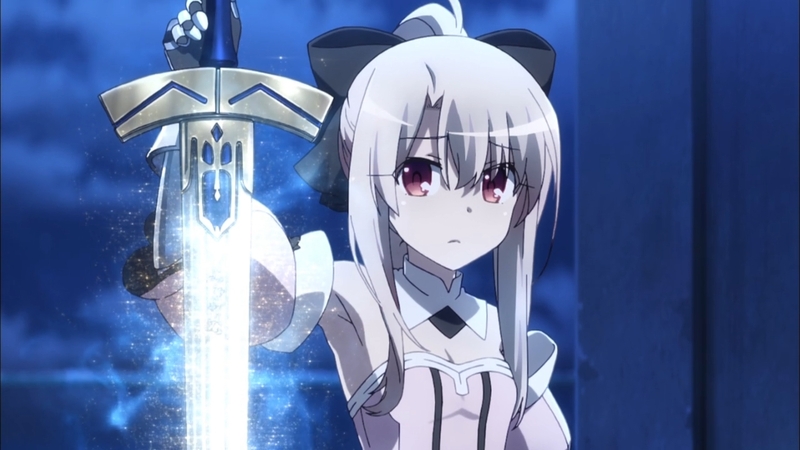 She arrived in the town a few days before Illya did after their brief clash with Beatrice and Angelica. So of course she was low and then came the fight against Illya here. She really did need to take advantage and recharge before things got dire. And she really doesn’t have any less extreme means of getting back that energy. 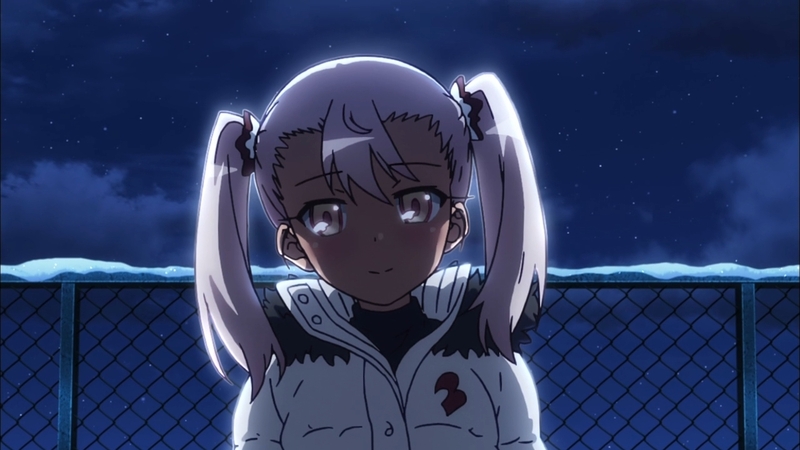 This episode was also a good reminder of just how important Kuro is to Illya. While they started out very much enemies, they truly have become a family. Kuro will give Illya the push she needs and Illya will end up surprising Kuro at times as well. None of them could take on this threat alone, but together they have a shot at it. I don’t have any complaints in this one. They got a good bit of time to recover and recap the situation. 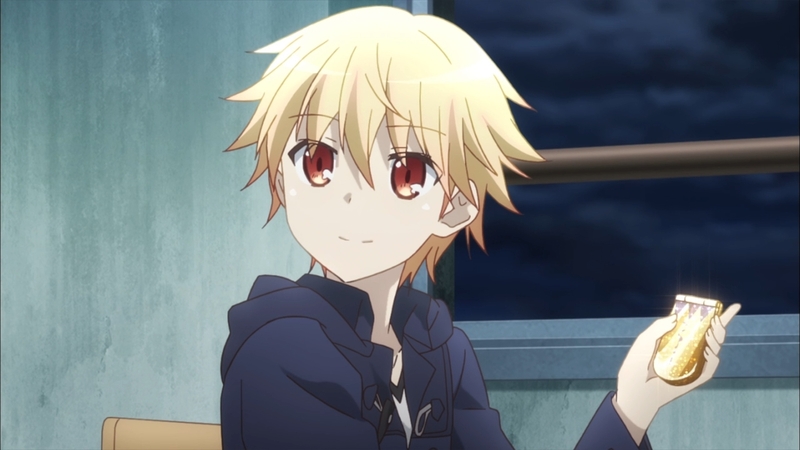 Bazett did the right thing in giving Illya access to all the cards they currently possess (outside of Kuro’s Archer) and have had a chance to work through some frustrations. 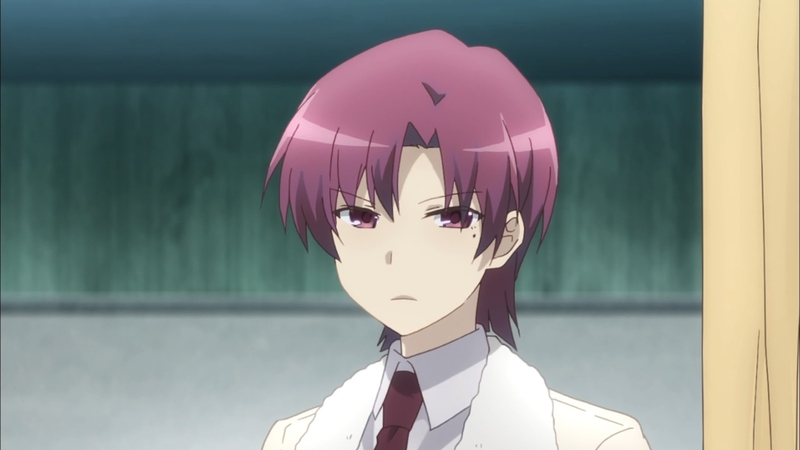 The key thing now is to get to Miyu and deal with the Ainsworths. The threat hasn’t gotten any weaker, but they know what has to be done. At least Gil is willing to work with them for the time being. So long as Angelica has the Gilgamesh card she is his target and he’ll cooperate with them in order to get close to her.